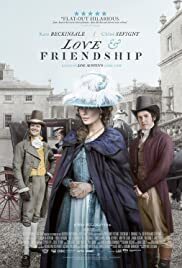 I was told to give this a shot by a couple of people since this is based off of Jane Austen's book she was never able to finish. It was a free watch on Amazon Prime so I decided to give it a go. Second....I liked this WAY more then the book version. GRANTED, the book version was not completed so you have to give it a little wiggle room. But yes, I loved the dynamics and how they played with the story line. It was good. However, that is where my like of the film ends. I was bored with 60% of the film. Yes, I usually don't films that revolve around talking and walking and just being social. But it is a tricky thing to make entertaining. This unfortunately flopped. I was yawning and constantly checking to see how much time was left. Sure there were a few scenes when I wasn't bored and I loved them. However, the majority of the film was a big meh. The ending was too happy. Lady Susan didn't deserve to have it all. I hated Lady Susan...she was a horrible character. Horrible and didn't deserve a HEA. In the end, I am glad I watched this. However, I was not happy with it. I was bored for 60% of it and I hated the ending. I do recommend this for Jane Austen fans. I'll give this 2 stars. One star added for the cast and how hard they tried.